The Wee Blether coffee shop serves delicious home baking, breakfasts & lunches. Forest Hills is a large hotel with a wide range of facilities including bars, restaurants, water sports and quad bikes. Has tourist information, various shops, restaurants, coffee shops and an art gallery. Post Office opens 8am-4pm, weekdays and 8am-noon Saturdays. Supermarket (Co-op) opens until 10pm Mon-Sat and until 6pm Sundays. Garage - has a selection of videos for hire (leave phone number) and good variety of newspapers, open 7am-7pm every day. Butcher - We recommend the award-winning Aberfoyle Butcher for delicious locally produced beef, lamb, pork, game, as well as terrines, pates, cheese & smoked products. 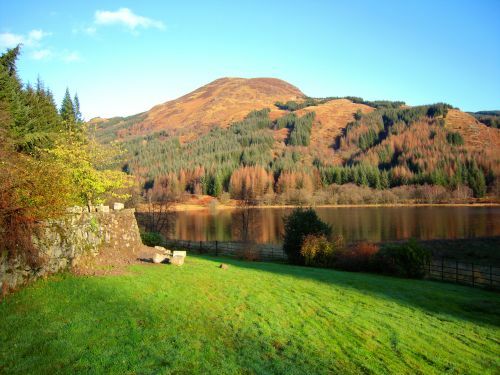 A busy, colourful holiday town, located below spectacular wooded crags, and overlooked by Ben Ledi, "mountain of God". There are many interesting traditional & modern shops, restaurants, cafes, tourist information, visitor centre, leisure centre & garage. Munchy's - coffee shop & restaurant serving home cooked food.Atrium Café - bright spacious restaurant serving delicious breakfasts & lunches - open till 5pm. Sherry's Restaurant - snacks, high teas & meals all day, and dinners in the evening. The Myrtle Inn - home cooked food served at lunch & dinner time. Waverley Hotel - family run, and renowned for fine food, cask ales & friendly atmosphere - children eat free. The Lade Inn (1 mile north of Callander) - as recommended by Egon Ronay, the AA, Britain's Best Pubs Guide, "Which" and CAMRA good beer guide. 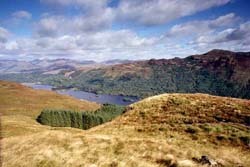 An attractive villages on A811, south of Aberfoyle, with delightful panoramas of the Campsie Fells & Carse of Stirling. Buchlyvie has a delicious tearoom and also pottery & craft shop. A pretty village off A84 with several interesting antique & other shops, and Doune Castle.